The Cooperation Programme INTERREG V-A GREECE-BULGARIA 2014-2020 is pleased to announce the 5th Call for projects proposals «Grant scheme for supporting SMEs to grow and expand beyond local markets» that will open on the 15th of February 2019. 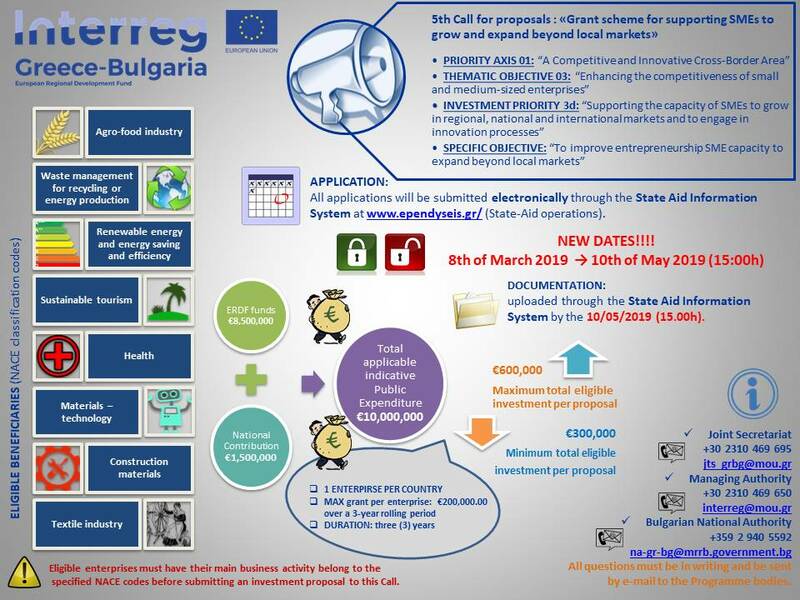 The Call is targeted to the Programme Priority Axis 1: “A Competitive and Innovative Cross-Border Area” which aims to enhance the competitiveness of SMEs in the Greece-Bulgaria border area (Thematic Objective 03) and contributes to Programme Specific Objective 02 “To improve SME capacity to expand beyond local markets” which aims is to stimulate enterprise growth of new and existing CB area SMEs through the expansion of economic activity to new markets and products. The intervention focuses on fostering value-added producing capability in enterprises by boosting their product and service development activities through joint economic development actions, preferably oriented towards innovation, to make it possible for them to access new markets. The total applicable indicative Public Expenditure of the present Call amounts to €10,000,000.00. Public Expenditure consists of €8,500,000.00 of ERDF funds and €1,500,000.00 National Contributions by Greece and Bulgaria. Maximum grant per enterprise (single undertaking) subject to the €200,000.00 over a 3-year rolling period as per de minimis Regulation (EU 1407/2013). Eligible enterprises must have their main business activity belong to the specified NACE codes before submitting an investment proposal to this Call. New enterprises must state the relevant NACE that corresponds to their main activity and the eligible geographic area where they conduct business activities, and are requested to proceed in the establishment of the company up to 3 months from the date of approval of the grant application, after which the Subsidy contract will be signed. Each eligible potential beneficiary (Lead Beneficiary Enterprise) submitting a project proposal should include in the proposal one other eligible potential beneficiary (Project Beneficiary Enterprise) from the other participating country, with whom - according to Art.12 par 4 in Reg.1299/2013 – the project beneficiary shall cooperate in some capacity for the development and implementation of the proposed investment plan. The time period for the completion of any investment supported through this Call shall be three (3) years. All applications will be submitted electronically through the State Aid Information System at www.ependyseis.gr/ (State-Aid operations). The Call will remain open from 15/02/2019 to 15/04/2019 (14:00h). The Call will remain open from 08/03/2019 to 10/05/2019. The deadline for submission of applications is 15:00h of 10/05/2019. After this deadline, the electronic system will close and no more applications will be accepted. All required documentation, which has not been uploaded through the SA MIS, must be submitted (in person or by mail) in hardcopy to the Managing Authority of the Cooperation Programme Interreg V-A Greece-Bulgaria 2014-2020 by the deadline (15/04/2019) of this Call. Consultation will be provided to the potential applicants through Information Days that will be organized in both countries (Greece and Bulgaria). Find more information here. NOTE: The Bulgarian and Greek translations of the SAMIS Manual will be available on Thursday the 14/03/2019. 6.(NEW!) By filling in the excel file attached here and sending it to the Joint Secretariat (JS): jts_grbg@mou.gr . By filling in and sending this file, you give your consent to publish your data on the Programme website, thus, please provide us only with official data of your enterprise and not personal data. The file will be updated every Friday and published on the Programme's website.